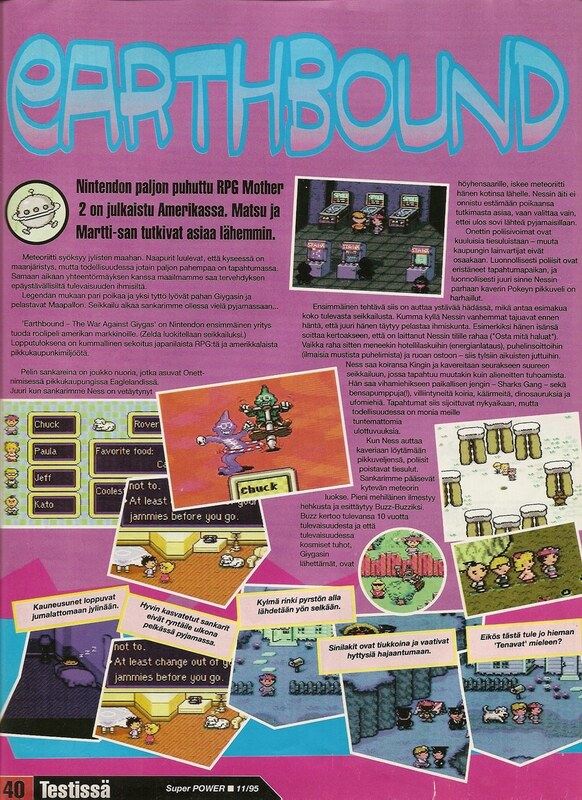 We’ve looked at a whole bunch of magazine reviews of EarthBound, most of them pretty bad. Here’s another review of EarthBound from European magazine “Super Power”, courtesy of Lucky the Fox. This review was from 1995 and was originally written in Finnish but then translated into Swedish. Nintendo’s famous RPG, Mother 2 has been released in America. Matsu and Martti-San investigate further. 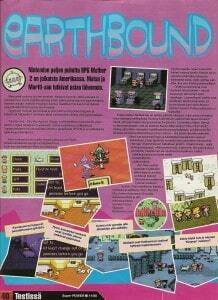 ‘Earthbound – The War Against Giygas’ is Nintendo’s first attempt to bring a roleplaying game to American market. (Zelda is considered adventure.) Result is a strange combination of Japanese RPG and American small town milieu. The game’s heroes are a group of youth living in Onett, a small town in Eagleland. Just as our hero, Ness, has gone to bed, a meteorite lands near his home. Ness’s mother can’t stop his son from investigating, but only nags about how it’s not appropriate to go outside wearing pajamas. Onett’s police force is famous for its road blocks – the town’s law enforcement can’t do anything else. The police have naturally closed the scene and that’s naturally where the little brother of Ness’s best friend, Pokey, has wandered to. So the first mission is to help a friend in need, which gives a taste of the adventure to come. Strangely enough, Ness’s parents realise before him that he’s supposed to save the mankind. For example, his father calls to tell that he has put money on Ness’s account (“Buy whatever you want to”). Even though the money goes to hotel bills (restoring energy), phone calls (free from black telephones) and buying food – boring adult things that is. Ness takes his dog, King, and friends along on a great adventure, where other things than just destroying aliens happen. He becomes enemies with a local gang – Sharks Gang – and gas pumps(! ), feral dogs, snakes, dinosaurs and spacemen. Behind Earthbound is a man named Shigesato Itoi. In his youth, he got numerous influences from American pop culture. And that shows. The game is obviously aimed at younger gamers and those who aren’t normally interested in RPGs. The feel of the game could be compared to Shadowrun and the drawn backdrops and characters have something Bart-esque to them. The game environment is a markedly American small town with phonebooths, banks and librarians. Japanese influences aren’t evident as much in demons and dragons as they are in how the Japanese see an American small town. It’s hard to critizise an ambitious attempt to popularize roleplaying games. Earthbound probably manages to attract roleplayers of tomorrow. Even the hero carries a baseball bat as a weapon rather than an Excalibur sword usual in RPGs. Then there’s such a thing as the soul of the game. Games coming from the home country of roleplaying games seem to somehow magically trap their players. The feel of hamburgers and Coca Cola in Earthbound makes it hard to get sucked in the mysterious mood of the adventure. Earthbound is the only choice for a roleplayer who has gotten tired of dragons and evil gnomes. American schoolboy in the main role may seem a bit idiotic, let alone that credit cards and American fast food is needed in order to reach the goal of the adventure. Yet it’s not idiotic, just slightly different and very fun. The only annoying aspect are the battles, where psychedelic monsters wobble around the screen. The entire game balances between horror and comedy which creates a feeling that the player is an extra in some cheap American film. This is simply an adventure which has Coca Cola rather than magic potions, arcades rather than castles and average Joes rather than exotic heroes. Graphics: 76 – Slightly more NES-esque than Bart’s SNES adventure, otherwise highly similiar. Challenge: 82 – Plenty of ambient noise that plays for a bit too long. Feel: 82 – Battles require sharp control of the gamepad. Challenge: 78 – Easy for experienced players, perhaps a little too many dialogue screens for beginners. OVERALL: 77 – Is Coca Cola better than Elixir? Decide for yourselves. Beauty sleep ends with a massive noise. Well raised heroes don’t run around outside in nothing but pajamas. Bluecoats are firm and demand the youngsters to scram. Doesn’t this resemble ‘Peanuts’ a little bit? Earthbound’s first bad guy is named Chuck. The meteor glows ominously, as if predicting the things to come. * note: this might be a movie quote or something, but since I don’t recognize it, I can’t use the proper English version. I think it’s surprising that this review was as positive as it was, it seems like most game magazines back then crapped all over the game. I think it might be because these Super Power people actually played through the entire game though. Some of the U.S. magazines seemed to only play half of Onett and call the game “a Barney-esque romp through a McDonald’s playland”. I think the fact that the review said “The entire game balances between horror and comedy” is proof that these guys at the very least played a good chunk of the game. It’s so odd how EB was released to mediocre reviews, but now, it’s constantly making “Best SNES Games Ever” lists and the like. Shouldn’t it be: Graphics, “Sound”, Feel and Challenge instead of having challenge twice? I think that was a typo in the original article. BTW I got the Pink Cloud’s melody… yay! Based on the pictures (since they are captions) I think they’re referring to the policemen, even though they aren’t wearing blue. Are you sure it’s not the other way? The images have finnish text. I prefer Chuck over Ness. fredrik: I knew I’d mess that up somehow, heh. I’ll fix it later in the day. I’m still discovering stuff about this 14 year old game. I just realized that the Peanuts influence probably spawned the Hint guy ala Lucy’s Advice Booth. It even has the “in” sign. As someone who has lived in Sweden, I can definitely say that the humor of Earthbound is right up their alley. Scandinavians definitely have a very quirky sense of humor. Maybe if they sold Earthbound in those countries, the series would have been more popular than it is today. The translation of page 1’s fourth caption has a small mistake. It should say ‘Bluecaps’, not ‘Bluecoats’. There was a very old EB review on a brazilian magazine called “Ação Games”, it was through this review that I first heard something about EB. It was only many many years latter that I had the oportunity to actually play it (because at that time I didn’t had a SNES), but it was still that old review that lingered in my mind and made me look for EB and play it. leommj: How long ago was that? I’d love to know more about it, maybe someone here might know where to find the review too. 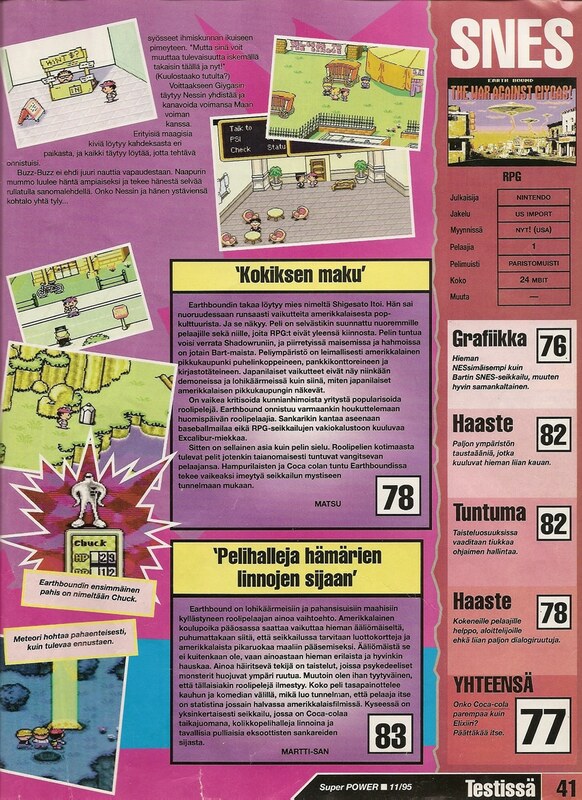 EarthBound review from Finland? (My homeland too) It’s good to see that they give positive number for the game. 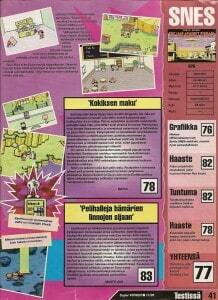 Wow, I’m actually suprised to see review about Earthbound in my language, as because Earthbound never made in Europe. Yes, that’s even more interesting to see that they even seemed to play through entire game. Thank you for sharing that Mato. What, does he do roundhouse kicks now? There is a cool drum choir called the bluecoats, haha. Maybe it was a mistake that the editor didn’t catch?